Scoops: Scoops Reports 2011 - 12 November 2011 Torrs Warren – Sandhead. Scoops Reports 2011 - 12 November 2011 Torrs Warren – Sandhead. 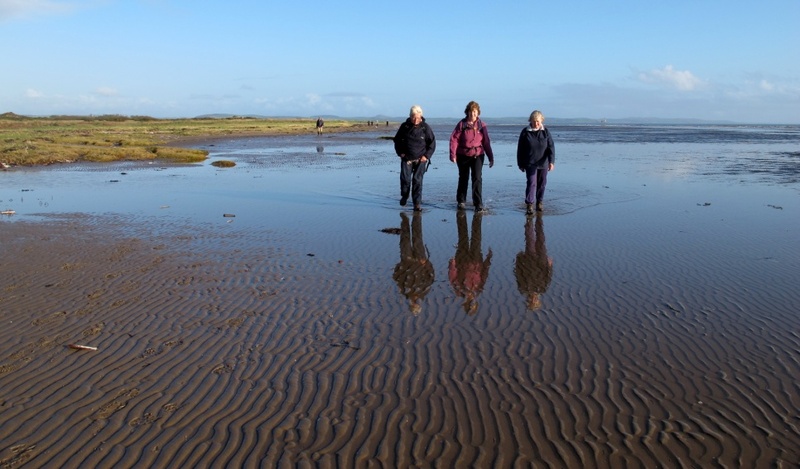 Wigtownshire Ramblers 12 November 2011 Torrs Warren – Sandhead. On a sunny November morning, 16 ramblers gathered at the Bareagle Car Park, Torrs Warren for the walk. The first part of the walk took them east through the plantation. Pleasantries were exchanged with an elderly dog walker and a horse rider enjoying the bridle path through here. Frances, Isobel, Mike, Mary Sloan, Jack, Mary Mitchell, Irene, Audrey, Andrea, Peter 3rd (NS), Jim, Ken, Carl, Debi, Leslie and Christine Sloan managed to find space in the crowded car park – this is a popular dog walking area! Loud music – Mozart, maybe – was playing: apparently this is an attraction to the birds which come flocking in to be fed at one of the dozen or more feeding cages. After a couple of kilometres a right turn led to the edge of the forest and grassy dunes. A left turn along an undulating sandy path led to Ringdoo Point. The plantation helps to stabilise the dune system at the back of Luce Bay - the dunes themselves are part of the military range. 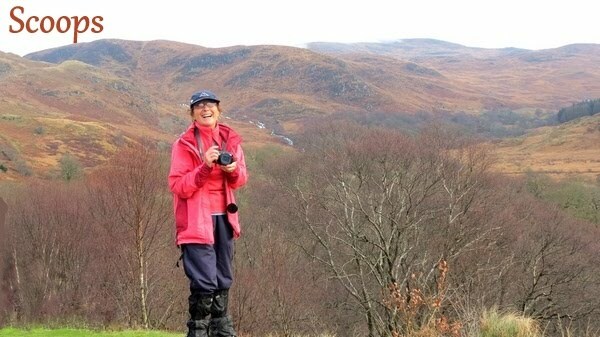 Upon reaching Ringdoo Point a few moments were taken to absorb the scenery. Luce Bay was bathed in magnificent sunshine, landmarks over on the Machars were identified and pointed out. 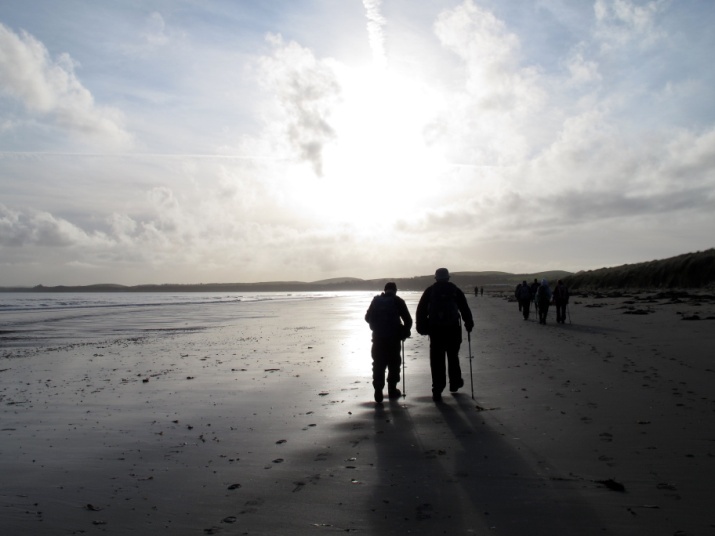 Now began a long beach walk along Luce Sands. Luce Sands is one of the largest beach complexes in Scotland and easily the largest in Galloway. The beach stretches for approximately 11km from the mouth of the Water of Luce in the east, to the village of Sandhead in the west. The ramblers will walk 9 of those 11 kilometres. Passing the dunes area known as the Devil's Meal Chest, the target of Sandhead to the South West looked small in the distance. To the south, the Mull of Galloway could be seen. Remnants of military manoeuvres could be seen amongst the dunes, while out in the bay target bases for bombing practice stood prominent. During the walk a variety of sea and shore birds were spotted. Amongst those identified were Oyster Catchers, Curlews, Golden Plovers and rarely seen in Scotland a Little Egret. A number of very large jellyfish were beached. A sad sight, a small grey seal lay dead, it's head damaged either by having been hit with a boat's outboard engine or from birds pecking. Amongst the tidal refuse, numerous balls, plastic ducks, glittery shoes, balloons promoting Tin Tin and crab apples were seen. Nearing the halfway point of the walk a lunch break was taken close to Clayshant Control tower. After lunch the high tide started the fun part of the walk. Walkers had to decide whether to walk with boots and socks off, or try to avoid the areas where the water swirled in. Those who decided to divest themselves of their footwear probably came out best. 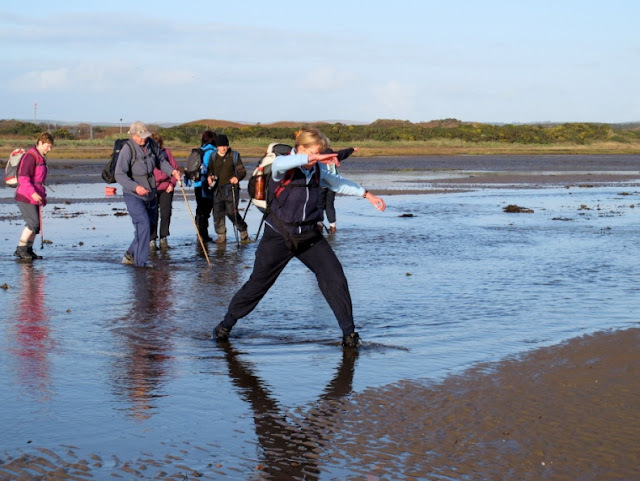 We reached a huge section of beach which had to be negotiated, jumping from clumps of vegetation to another and even wading through sections of the sea! 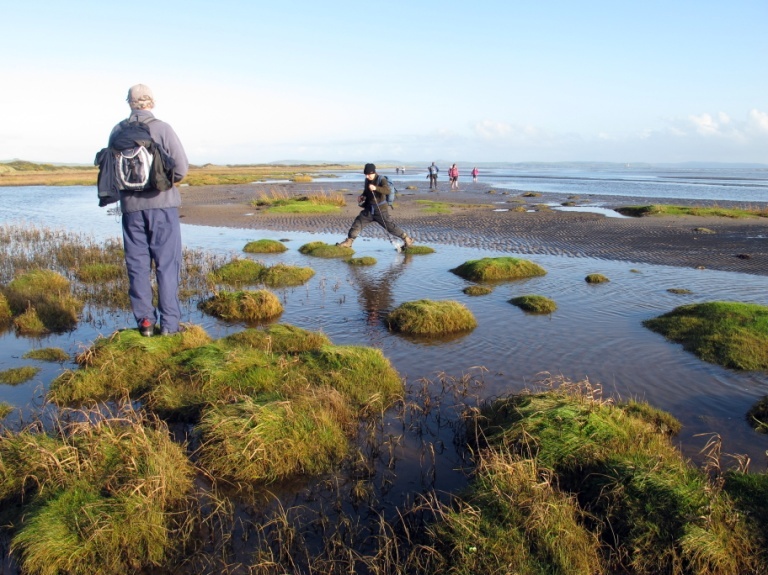 Some walkers took off their boots and socks and rolled up their trousers but I managed to keep my feet dry in my boots and gaiters – amazing! Back on dry land the walk leader provided towels for those in need, and boots and socks were again donned. Unfortunately for some this was a little premature as another burn needed crossing. We were having a brilliant time, the weather was good and we were laughing such a lot! 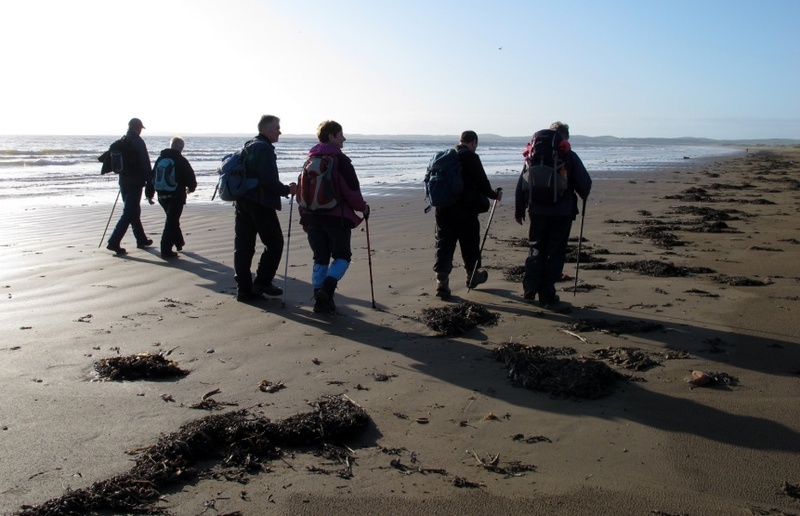 Soon however they were approaching Sandhead and found solid ground by walking through Carisbrooke Caravan Park. Arriving in Sandhead the sun was disappearing behind gathering clouds, however tea coffee and cakes at the Woodlea tearoom ensured the brightness remained. Frances, Isobel, Mary Sloan, Mary Mitchell, Irene, Audrey, Andrea, Peter 3rd, Jim, Ken, Carl, Debi and Christine Sloan enjoyed one another’s company and refreshments. It was a fitting end to a wonderful day's walking.